The permanent exhibition on the upper floor is divided into three sections. The first section focuses on the Torah, synagogue and Jewish community. The Torah is the central reference of Jewish life. It contains the five books of Moses written on scrolls. 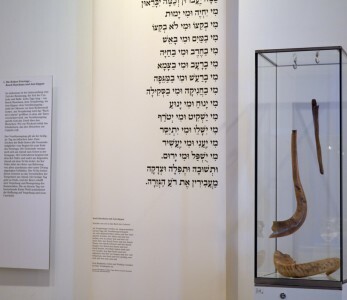 The Torah scrolls are kept in a cabinet in the synagogue as the house of prayer and meeting place of the community. The second section Home – Family – Individual – shows Jewish life in relationship to the Torah and also how it has developed under the influence of changing social circumstances. The third section on the Shoah and new start focuses on the threat to Jewish life during the Nazi regime which ended in destruction and a complete loss of all rights. 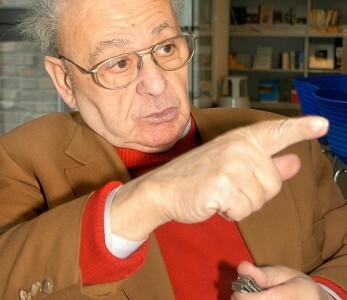 Despite the experiences suffered during the genocide, after 1945 some survivors dared to make a new start in Germany. Click on the picture to play the audio file. The Jewish history of Westphalia is mainly a story of ordinary people. We tell this story by featuring 14 individual people and thus show the situation of Jews through different eras in a non-Jewish majority society. And above all, they themselves speak: in their statements and (a few) legacies, reports and descriptions. These biographical sketches range from the Middle Ages to the reconstruction of Jewish life after 1945. 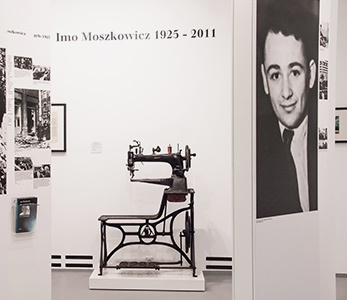 The exhibition tells the story of cattle dealers, merchants, Jewish workers from Eastern Europe, writers, teachers, rabbis, artists and influential men and women. You can also hear many of them tell their stories.